Born in 1972 in the city of Campinas, Brazil, Daniela Matchael is an artist whose roots in realistic academic drawing are intrinsically translated into her powerful abstract approach to composition and color. Throughout her childhood and adolescence Daniela took drawing and painting lessons at different local artists studios in her home town. In 1990 the artist enrolled at the renowned Escola Panamericana de Artes in the large city of Sao Paulo. While still attending art school, Daniela worked as an apprentice at her instructors’ private studios where, in 1991, she began to teach basic drawing and painting in. After teaching at other artists’ studios Daniela taught at different private art schools and at her private studio from 1993 through 1997. Using her maiden name as her artistic persona (Dani Rangel), the artist was part of numerous group and solo exhibits at local restaurants and galleries. Matchael moved to the United States in 1997 where she went back to school seeking to finish her formal studies in Fine Arts. Then raising a family of her own the artist pursued between 1998 and 2006 a career as a private muralist and still painted on canvas. 2007 was a turning point in her life and career. The impending changes instilled the artist with new dreams and possibilities. With new perspectives, Daniela began to; as she describes it, furiously paint. Her most current pieces result in a mature reflection of the development of her art. The artist concentrates on the balance of her compositions and the interaction between the colors in her complete palette. 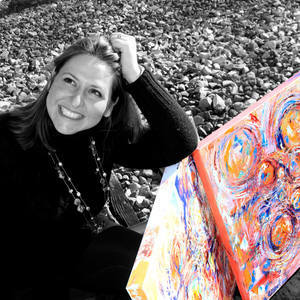 The Daniela Matchael is directly engaged in the development of her art and her career as an artist. Daniela Matchael is involved with various international artists groups and organizations engaged in the promotion and general population awareness and engagement in art. Daniela’s current work can be found in private collections in the United States, Australia, England and Brazil. She has been part of exhibits in the U. S., Canada, France, Italy, England and Brazil.